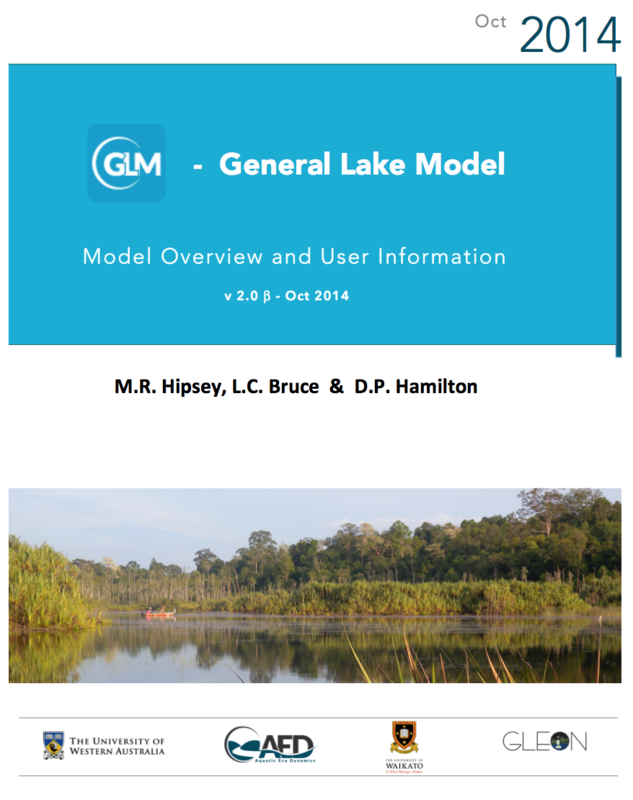 This site summarises the 1D lake water balance and vertical stratification model: “The General Lake Model” (GLM). GLM (not to be confused with General Linear Model) has been designed to be an open-source community model suited to environmental modelling studies where simulation of lakes or reservoirs is required. The model has been developed as an initiative of the Global Lake Ecological Observatory Network (GLEON) and in collaboration with the Aquatic Ecosystem Modelling Network (AEMON) that started in 2010. The model was first introduced in Leipzig at the 2nd Lake Ecosystem Modelling Symposium in 2012, and has since developed rapidly with application to numerous lakes within the GLEON network and beyond. The model couples with the Framework for Aquatic Biogeochemical Models (FABM) for integrated simulations of lake and reservoir water quality and ecosystem health, and the precompiled binaries provided here include integration with FABM and/or AED2. GLM computes vertical profiles of temperature, salinity and density by accounting for the effect of inflows/outflows, mixing and surface heating and cooling, including the effect of ice cover on heating and mixing of the lake. Since the model is one-dimensional it assumes no horizontal variability so users must ensure the lake conditions match this one-dimensional assumption. 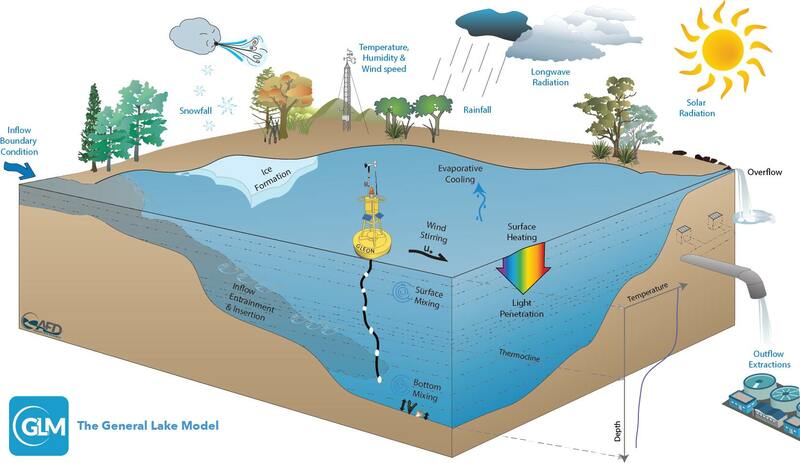 The model is ideally suited to long-term investigations ranging from seasons to decades, and for coupling with biogeochemical models to explore the role that stratification and vertical mixing play on the dynamics of lake ecosystem. GLM incorporates a flexible Lagrangian layer structure similar to the approach of several 1-D lake model designs (Imberger and Patterson 1981; Hamilton and Schladow 1997). The Lagrangian approach was originally introduced in the model DYRESM developed by the Centre for Water Research and allows for layers to change thickness by contracting and expanding in response to inflows, outflows, mixing and surface mass fluxes. When sufficient energy becomes available to over come density gradients, two layers will merge thus accounting for the process of mixing. Layer thicknesses are adjusted by the model in order to sufficiently resolve the vertical density gradient. Unlike the fixed grid design where mixing algorithms are typically based on vertical velocities, numerical diffusion of the thermocline is limited, making the GLM approach particularly suited to long-term investigations. Although GLM is a new light-weight model code, many of the heating and mixing algorithms have been based on equations presented by Hamilton and Schladow (1997). GLM has been written with a modernised code structure and features a number of customisations to make the model easy and efficient to use. The model integrates with LakeAnalyser (LA) for derivation of numerous metrics of relevance to lake hydrodynamics and may also be integrated within a Markov Chain Monte Carlo (MCMC) algorithm.